State highway police website hacked ! The state highway police's website was allegedly hacked by an unknown person, who changed the accident figures to show a steep decline in the number of deaths for the year 2010. The changed statistics show the number of fatalities went down by almost 9,000 between 2009 and 2010. In 2009, th e number of deaths was 11,396. The records for 2010 show the number of deaths to be 1,762, even though an earlier table shows the number of deaths between January and June 2010 to be 6,588. The highway police said they are in the process of correcting the data on their website. 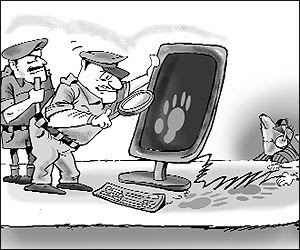 Superintendent of police (state highway) BG Shekhar told the Hindustan Times that the website was hacked some time ago. "We are trying to correct the data that appears on the website right now and we hope to put everything in order by Monday," Shekhar said. The police said figures between 2004 and 2008 have shown a consistent rise in fatalities on state highways. In 2004 there were 9,822 deaths reported, 12,397 deaths were reported in 2008. Additional director general (state highway) AK Sharma refused to comment, saying he was holding additional charge.